Take your First Responder Course with Air Down There Scuba! 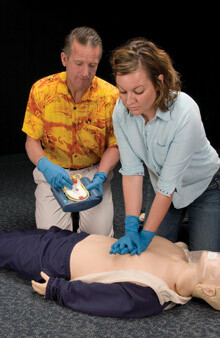 Emergency First Response (EFR) is PADI’s CPR and First Aid course. This course provides participants with invaluable, up to date training that every person should know. You will receive training in cardiopulmonary resuscitation (CPR), first aid and the use of an AED (automated external defibrillator). Includes the latest innovations in first response techniques and protocols. Follows protocols from the Basic Life Support (BLS) Working Group of the International Liaison Committee on Resuscitation (ILCOR). Satisfies MN-OSHA (Occupational Safety and Health Administration) CPR requirements. Meets CPR requirements for persons seeking certification through the American Council on Exercise. We offer this class at our facility or on-site at your business in the Twin Cities Metro area. Who should enroll in the Emergency First Response course? This course is geared towards people interested in acquiring or updating CPR and First Aid skills. There are no pre-requisites and is available for everyone, young and old. And, while this course is not diving specific, it does meet the requirements for the PADI Rescue Diver and PADI Divemaster certifications.